Faith Wins - Adventures with the Tuleys! It has been almost 6 months since Josiah’s last MRI! Wednesday, December 2, he goes back for another. I hate the anticipation. I hate the anxiety that creeps up during the weeks prior. I hate the constant stream of dreams that fill the nights, starting about two weeks before. I hate the feeling of being overwhelmed and being completely helpless to do anything about it. I hate the tension it causes. I hate it all. All of this happens, even before I’m fully and consciously aware that the MRI is coming up. It’s like clockwork. In fact, the other day, I was so stressed, overwhelmed, and just not feeling like myself. I took a moment to pause that evening when the house was quiet and I was left alone (and thankful Nathan had taken the kids to their activities) to do the housework and packing that needed to be completed. With tears of frustration and from being so overwhelmed, I realized I hadn’t been sleeping well, and considered all the odd dreams I had been having each night. Then I put it all together. I looked at my calendar and I saw it – the MRI was in two weeks. This happens each time we have an upcoming MRI. I honestly don’t dwell on the fact that the MRI is in a few weeks, yet somehow, my body seems to react with these somewhat uncontrollable responses. The results of a bad MRI are life changing. It’s happened to us, not once, but twice. There’s so much anticipation that goes along with trying to prepare mentally for another life change, yet holding out hope for an awesome report and wanting so badly to be able to go back to six more months of normalcy. One day can change everything. As I’ve struggled with the upcoming MRI and all that goes along with it, God has used individuals to speak into my life. He’s given me my husband – my sounding board, my encourager, my supporter, the one who allows me to express all I need to say, without fear of judgement, and allows me to cry and let it all out. He speaks life into me, reassuring me that with God in control, we can take whatever comes our way. I love that God has gifted me with Nathan to journey with me down this road of life. Thank you Nathan, for everything. I love you. Second, I’ve been reading a few chapters from a brand new book, Even If Not. Brand new as in – it’s not even available for purchase yet! I’m honored to be part of the Even If Not book launch team for a new friend I met at the Declare Conference in July. I’ve only read the few chapters I was given, and cannot wait until the book is released. Kaitlyn’s words are written so well, and I feel as if I could have penned many of them myself – although not nearly as well as she has! I find myself nodding my head in agreement as I read. One of my favorite quotes from the book is “We don’t actually need to know the future. 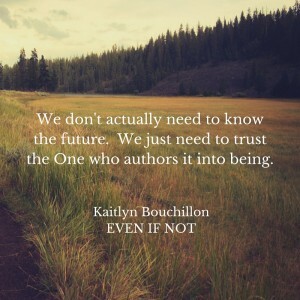 We just need to trust the One who authors it into being.” How true that is, and how amazing it is that God is using her words to speak deep into my soul, to remind me what it is I already know. Thank you Kaitlyn, for following God’s prompting to write this book and allowing me to part of your launch team. Finally, church yesterday morning reminded me yet again in the sermon titled “When the Road is Tough, FAITH WINS.” Rick’s words at the end reminded me to “Fix your eyes on Jesus. We don’t know what the future brings. One day can change everything. Maybe you need strength for that.” That’s exactly what I need. Because even though I KNOW without a doubt that God is in control, that He’s got this, that I have nothing to worry about, I still struggle with the “what if” questions that are thrown my way. I simply need to fix my eyes on Jesus. Thank you Rick, for ministering to me. Having been where we have been, walking down the roads that we have walked, I know what it is to give it to God and trust Him fully with the results. I know that no matter what happens, good or bad, God is in control and that we will be just fine. Although I know these things, living them on a daily basis is still an everyday struggle. Not because I doubt, but because I’m not sure it’s going to end the way I want. I know in the end that it will be ok, no matter the result. That doesn’t take away the anticipation and anxiety that the date of December 2nd brings. Just because I know I’ll get through it doesn’t mean I want to go through it. Just because I know and do these things…it doesn’t mean it’s easy, and it doesn’t mean I like it, and it doesn’t mean I don’t struggle. I pray that the MRI will be clear, that we can continue to live our lives as we have been over the past 1 ½ years off of chemotherapy treatments. I don’t want Josiah or our family to go through it all again. But if that’s what awaits us, it’s comforting to know I trust in the One who matters, and in the end, Faith wins! I am pretty sure I can relate to your struggle . . . but then again, when it concerns the life of your little boy, do I really when my children have been enjoyed great health?! I love your words. They are real. And I love that you don’t pretend with us. You struggle. But I love that you find strength and life in the Lord through the people He purposed to speak life into you. You are a wise woman. And your example speaks more life into mine. It’s a circle that comes right back to the Almighty . . . to Jesus. Thank you for your words. Praying for you all. I think we all relate in different ways. While it may not be the health of your children, your struggle is likely something I don’t fully understand! Thank you for your encouragement and kind words! And I hadn’t heard that quote, but I completely agree, and it may be one of my favorites now too! Thanks for sharing. I love this. The end. Praying for Josiah to have a clear MRI tomorrow. Trusting that God is holding his hand and yours as you walk through each day. I saw your comment on the Even if Not lauch page on FB. I’m a part of the launch as well. It was an excellent book! I finished it on the plane ride last week from east to west coast. As we saw family I was reminded there that the people are what matters and the experiences that we allow God to unfold. Thank you so much Jenn for your prayers! I’ve really enjoyed the book as well! I read a lot of it while my son was taking his bath one evening, and finished it up before going to sleep that night. I can’t put a book down once I start it.